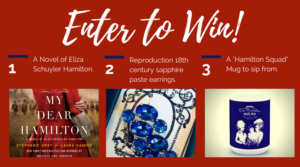 We’re getting closer to My Dear Hamilton, and that means we’re going to have lots of ways to celebrate the new release with you – starting with this amazing giveaway (US). A must-have for every Hamilton fan! And we hope you’ll grab your copy of the book today! ← America’s First Daughter is on Sale!